Get all those cables, decorations, and gardening tools off your garage floor and into NewAge Products' newly redesigned, Performance 2.0 Series modular garage cabinetry. These cabinets are built to last with their fully welded, 24-Gauge steel frames and fully lockable, double walled doors. Our configured sets are shipped with adjustable steel shelving; easy-to-grab stainless steel handles and height adjustable levelling legs that accommodate uneven garage flooring. The manufacturer's limited lifetime warranty gives you the insurance that your cabinets will look great for years. Performance 2.0 series lockers hold up to 800 lbs., base cabinets hold up to 600 lbs., and wall cabinets hold up to 100 lbs. The Husky 2-door Base Cabinet offers you total durability and maximum storage space. It is also ideal as a freestanding solution or docked under a Husky Workbench. The adjustable shelf inside of the cabinet makes organization easy, and the extremely durable magnetic catch powerfully holds the cabinet doors when closed. Perfect for a garage, basement or workshop, this Husky 4-Drawer Base Cabinet is the ideal tool storage and protection solution. It is also ideal as a freestanding solution or docked under a Husky Workbench. Four drawers of varying sizes can accommodate a wide range of items and simplify organization. Each drawer rides on auto-return ball bearing slides for smooth operation and can withstand evenly distributed weight up to 50 lbs. each. 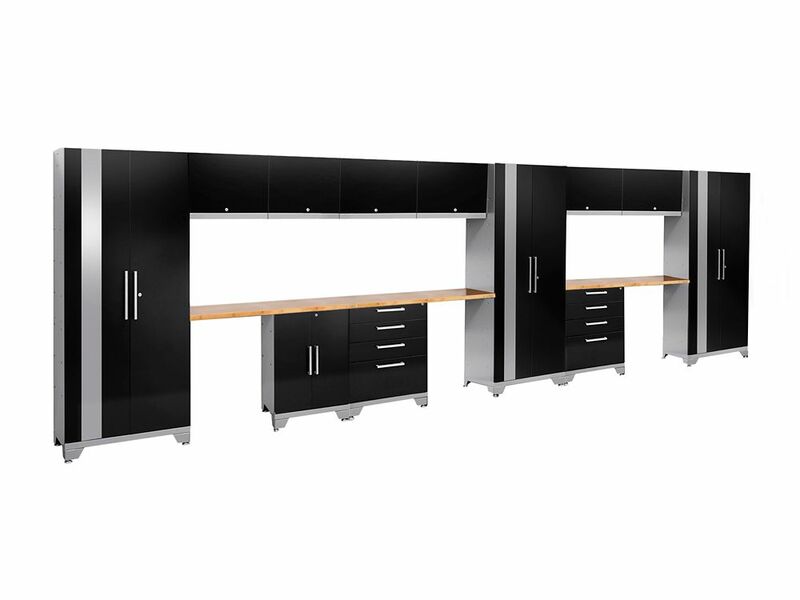 Performance 2.0 72-inch H x 234-inch W x 18-inch D Garage Cabinet Set in Black (15-Piece) Get all those cables, decorations, and gardening tools off your garage floor and into NewAge Products' newly redesigned, Performance 2.0 Series modular garage cabinetry. These cabinets are built to last with their fully welded, 24-Gauge steel frames and fully lockable, double walled doors. Our configured sets are shipped with adjustable steel shelving; easy-to-grab stainless steel handles and height adjustable levelling legs that accommodate uneven garage flooring. The manufacturer's limited lifetime warranty gives you the insurance that your cabinets will look great for years. Performance 2.0 72-inch H x 234-inch W x 18-inch D Garage Cabinet Set in Black (15-Piece) is rated 5.0 out of 5 by 2.